Animal Crossing: New Leaf has already caused a splash in Japan, and Nintendo will be surely be hoping to once again reel in a western audience to this social simulation extraordinaire of a franchise. As can be expected from that which came before it, you can buy, trade, chat, and help out your new anthropomorphic neighbours, dropping by their houses, or keeping their businesses afloat. 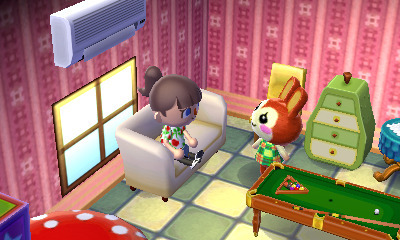 Shops open and close daily allowing you to furnish your home, update your wardrobe, and you can even catch a show courtesy of the infamous K.K. Slider. But when you’re not sipping on a cup of joe, there’s a little matter of settling the loan on your home but then again, there’s no rush unless you’re eager to expand your estate with more floors and extra space. Beyond decorating your own humble abode, there’s the world at your doorstep in need of care. Digging up weeds is a constant chore, whereas landscaping your town with flowers and trees is a satisfying pastime. Nurturing your town has always been the ultimate goal of the Animal Crossing franchise, though valuable additions introduced in Animal Crossing: New Leaf keep this formula from becoming stale. A combination of the 3DS touch screen and controls make Animal Crossing: New Leaf comfortable and easy to manage while the 3D effect brings your town to life. The classic Animal Crossing themes also return, remixed with a roster of new whistle-worthy tunes. A big addition to Animal Crossing: New Leaf is that you’re placed in charge of your town as its Mayor. As daunting as that may sound, your assistant Isabelle provides a wealth of tips and suggestions to keep your town from falling into chaos under your command. Your duties as mayor range from choosing a plot for your home, mingling with residents, and regularly appearing at events such as the tree planting ceremony as your first official duty to commemorate your new job. Then there’s the matter of town planning. Permits allow you to construct buildings, bridges, and furnishings as you see fit – assuming your approval rating will allow it. Mayors will need to help out their people, recycling, and changing the town’s flag and tune to keep your residents interested. Meanwhile, ordinance allows you to play god by setting the rules in your town. Choosing to make your village active at certain times will affect store-opening hours, while others such as enforcing a tidier town will take some of the burden off you to pick up after others in your free time. Another neat touch is the Megaphone, which comes in handy when you’re looking to track down a villager—simply shout their name into the 3DS mic, but not close enough to deafen them! Naturally, you’ll need to familiarise yourself with you surroundings and another new addition to Animal Crossing: New Leaf is Re-Tail, a store run by alpaca duo Reese and Cyrus where you and other residents can put items up for sale. This extends to the online experience, giving your foreign visitors a chance to splurge on some rare items. Re-Tail later opens up as a upholster where Cyrus will customise your furniture with your own patterns and designs. North of town, you’ll find Main Street, a small bustling area crammed with buildings and shops to explore – some of which should be recognisable to fans of the series. Dropping by the Post Office allows you to send mail to the locals and access to a cash machine to pay off your house loan. The Museum continues to welcome donations of fish, bugs, fossils and paintings you discover while the Able Sisters return with all manner of clothing and bespoke outfits. Nook also runs Nook Homes, you’ll drop by whenever you need to have some renovations done on your house. Nookington Junctions meanwhile is the biggest store, home to an assortment of furnishing and tools with new additions coming in stock regularly. 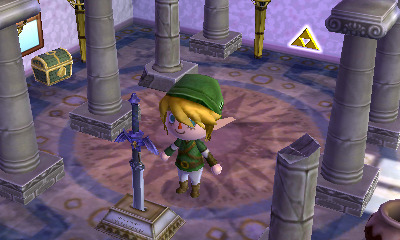 Play Coins can be spent on the Fortune Cookie, each one allowing you to obtain a fortune that, if lucky, can be exchanged for rare Nintendo-themed items. Tom Nook and Lyle return to run their real estate agency, enabling you to expand or customise your property, whilst a new flower shop owned by Leif grants the opportunity to purchase plants or saplings. Yet it is Main Street’s brand new area – the Happy Home Showcase – that will set your friend’s tails wagging. Making use of the handheld’s StreetPass feature, this allows you to share model homes with others that own the game. These can be visited at leisure, with items inside able to mail ordered to spruce up the interior of your own pad. It doesn’t end there either, with the Tropical Island perhaps being my favourite part about the game. While the original Animal Crossing for GameCube allowed you to link up your Game Boy to visit an island, this feature makes a long awaited return with a bang. After a few days, you’ll soon meet Capp’n catching a tan on the beach. Hopping aboard his boat will whisk you to a mysterious isle on which you can discover rare items, bugs and fish. There are also mini-games here, playable alone or with friends online, that cover everything from bug catching, popping balloons, and hide ‘n seek! Completion of these rewards you with medals, which in turn can be traded for exclusive items. 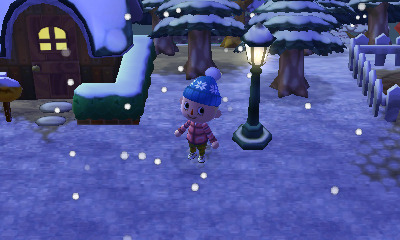 At this point, the fact that we haven’t even covered the screenshot feature or Best Friends mode should be a good indicator of the vast amount of content and unlockable features crammed into Animal Crossing: New Leaf – some of which we’re still scratching the surface of a good 40 hours in! However, the lack of online chat is disappointing with text communication feeling a little archaic, whilst the inability to join games directly through your Friends List à la Mario Kart 7 and Kid Icarus: Uprising is a major oversight. Building upon the well-trodden formula, Animal Crossing: New Leaf is a refined, polished, and fresh new approach making it the best game in the series. 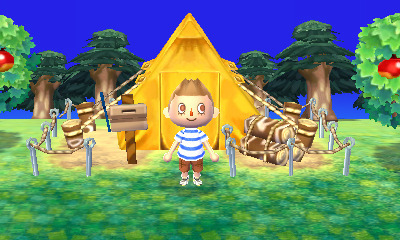 The ultimate Animal Crossing experience!